The perforation of the gallbladder in cases of incidental gallbladder cancer- And the indication for the use of isolation bags. Introduction: The accidental intraoperative perforation of the gallbladder is a problem of the laparoscopic surgery, if an incidental gallbladder carcinoma exists at the time of operation.According to the literature this complication comes up to 30% of the laparoscopic operations. In order to prevent the dissemination of tumourcells the use of an isolation bag is proclaimed.The question is if the intraoperative perforation of gallbladder carcinoma really leads to a prognostic deterioration and if the patients which have been treated with an isolation bag have a prognostic advantage. 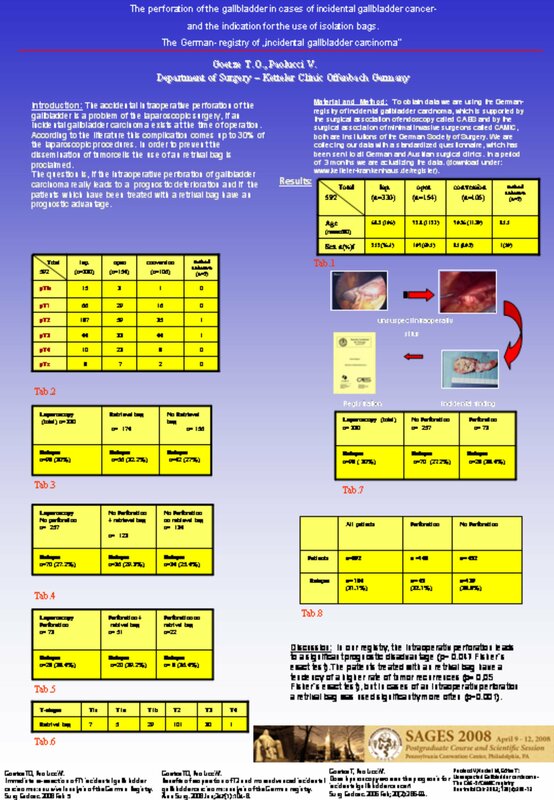 Material and method: To obtain data we are using the German- Registry of incidental gallbladder carcinoma, which is supported by the German Society of Surgery.We are collecting our data with a standarized questionaire, which has been sent to all german and now to all austrian surgical clinics as well.In a period of 3 months we are actualizing the data. Results: 550 cases of incidental gallbladder carcinomas are registered. 307 were operated laparoscopically, 97(32%) of them get a relapse of the tumour.158 patients were treated with the support of an isolation bag, the rate of a relapse was 35% (n= 55).149 patients of the laparoscopic group have been treated without a isolation bag, the rate of an relapse was 19% (n= 28).In 68 of 307 laparoscopically treated patients there was an intraoperative accidental perforation of the organ, the rate of a relapse was 41% (n= 28).In 46 of 68 cases an isolation bag was used, the rate of a relapse was 43% (n= 20).The other 22 of 68 patients who were treated without an isolation bag have 36%(n=8) tumour recurrences. The group without an intraoperative perforation (n= 239) have 29% (n=69) of tumour reccurence.112 of this 239 were treated with the use of an isolation bag, 35 (31%) of them had a tumour recurrence, the other 127 of the 239 patients treated without a bag had a recurrence rate of 27% (n= 34). Discussion: In our register, the intraoperative perforation leads to a significant prognostic disadvantage(p 0,05 Fisher`s exact test), but the isolation bag was used significantly more often in cases of gallbladder perforation. Nevertheless the recurrence rate is higher in the group treated with the use of an isolation bag, without having a perforation of gallbladder compared to the group without perforation and without a bag. The reasons therefore (e.g. microperforations) have to be discussed.